Rachel takes the win by over nine seconds! Her 5th Consecutive World Cup makes certain of the World Cup Overall title after just six rounds. Gee rode it right on the edge, 100% committed but a few mistakes cost him time - 4th place for some valuable series points. GT Factory Racing's first-year Elite rider Taylor Vernon finished in 60th. It was a hot, dusty weekend and the racing was equally hot. 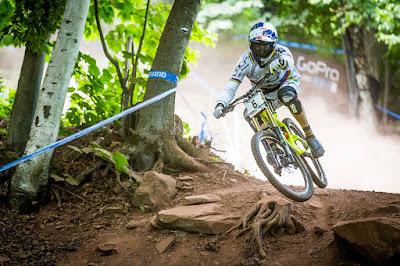 The Windham track, in New York, USA is short but intense. It's packed with technical sections, jumps and high speed sections making it one of the most challenging tracks on the circuit - the GT Factory Racing riders love it! Rachel had qualified in first place (3.05.132) by 2.39 seconds from French rider Myriam Nicole. UK's Tahnee Seagrave was in 3rd and Manon Carpenter 4th, 10 seconds behind Rachel. Come Finals Manon put in a solid run of 3.10.082 but was still five seconds behind Rachel's quali time. Would it hold? Tahnee rode well but slotted into second place then Myriam Nicole had a crash, losing time and slotting into an eventual 5th. Only Rachel was left on track and she blazed down the trail, beating her own qualification time by over five seconds, putting over nine seconds into Carpenter and rest of the field and clinching the Overall title in decisive fashion! Rachel's weekend was made extra special by the entry of one of her childhood idols in the race. Missy Giove raced this weekend for the first time in years in honour of her wife, Kristin. Rachel said: "I was so starstruck, watching my Go Pro's with Missy was surreal! It's been such an awesome weekend, such a fun race and I'm so, so stoked with today's win and the Overall. Thanks to the WILD crowd!" In the Men’s race Taylor had qualified in 46th. He couldn’t quite match that in Finals finishing 60th overall. When Gee came on track 32nd qualifier Loris Vergier had been in the in the hot seat through 27 riders. Gee was pinned through the roughest sections but a couple of small mistakes cost him valuable seconds, he slotted into 2nd place behind Loris but next run Greg Minaar put time into them both. Second qualifier Loic Bruni was up at split one and the crowd were on the edge of their seats but he punctured, taking him out of contention. 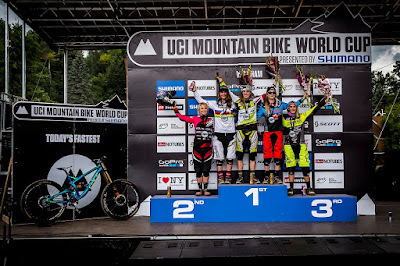 Only Aaron Gwin was left on course. Gwin put in a super- human effort, sometimes looking on the very edge of control. He came down 3.5 seconds faster than anyone on the field to take his 13th World Cup win. The team also took the team of the day award placing them in the lead of that competition with one round to go.